Enjoy these chilli chocolate mince pies – recipe courtesy of Paul Da-Costa-Greaves of Feeding Your Imagination. For the pastry, add flour & almonds to food processor, add butter & pulse till breadcrumbs, sprinkle in sugar, zest, add egg, essential oil and milk, pulse till it comes together, remove from bowl and squeeze together if dry add a couple of drops of water, roll into a ball, wrap in cling film, chill for about half hour. Take all the mincemeat ingredients and place into food processor pulse a couple of times, remove and leave to infuse flavours. Roll out pastry to approx a couple of mm thickness and using round or fluted 7in cutter cut approx 12 discs out to sit in your bun tin. Then using a smaller 6in round or fluted cutter, cut 12 more discs of pastry out for the top. 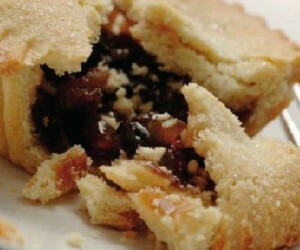 Spoon 2 tsps of the mincemeat into the pastry bases and dampen the sides, place the smaller pastry lid on top, egg wash then bake for 12-15 mins or until golden brown. Remove onto wire rack to cool, dust with icing sugar and serve with a good strong cuppa Yorkshire tea!